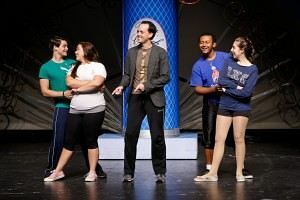 Guest choreographer David Rossetti (center) and cast members Haden Rider, Rane Tipton, Greg Hunter and Ashley Campbell rehearse for the Gainesville Theatre Alliance production of Hairspray. The Gainesville Theatre Alliance 2011-12 season opens Tuesday, Nov. 8 , with the production of Hairspray, the Tony Award-winning musical with by Mark O’Donnell and Thomas Meehan with music by Marc Shaiman and Scott Scott Wittman. Performances in Hosch Theatre in the John S. Burd Center for the Performing Arts on the Brenau Gainesville campus are at 7:30 p.m. Nov. 8-12 and Nov. 15-19, 2011; 2:30 p.m., Nov. 13 and 19. Tickets are $20-24 for adults, $18-22 for seniors and $14-16 for students. Patrons can select their own seats on the website at www.gainesvilleTHEATREalliance.org or purchase tickets through the GTA Box Office from 10 a.m. to 4 p.m. weekdays at 678-717-3624. Hairspray ran for more than 2,500 performances on Broadway between 2002 and 2009. Built 1960s-style dance music and “downtown” rhythm and blues, the play, set 9n 1962 Baltimore, focuses on the travails of a plump teenager, Tracy Turnblad, whose dream is to perform on a local dance show. She then moves on to launch a campaign to racially integrate the show. Hairspray is a social commentary on the injustices of parts of American society in the 1960s. Choreographer for the Brenau performance is David Rossetti, who was featured in the 2003 national tour of the musical. Rossetti is no stranger to Brenau audiences, having choreographed previous GTA product.